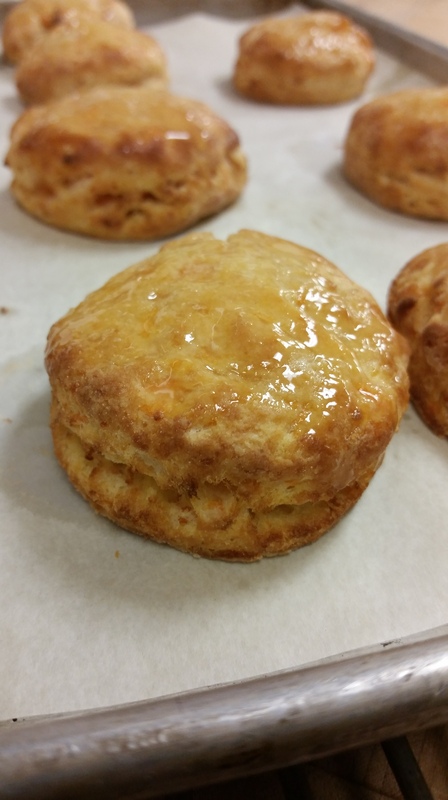 There is nothing much to say about the amazing biscuits that is not said in their name – Sweet Potato Biscuits. I am not a fan of biscuits… and yes, I was born and raised in the south. Yes, I had grandmothers and great-grandmothers who made biscuits from scratch…. and a great-aunt who performed this magical alchemy of flour and fat with deft of hand as well. However, I just never warmed up to the texture of this moist doughy quick bread even with lashings of butter and spoons of preserves or jam. Toast, yes please. My disdain for biscuits changed once the earthy yumminess of sweet potato joined in the fun. I love sweet potatoes (in all ways except candied or in sweet potato pie – still Southern!). Here is the part where I can tell you all of the great nutritional facts about sweet potatoes. I include that sweet potatoes are a wealth of beta-carotene, vitamin A, and a generous amount of fiber, especially if you eat their skin as well. I warn that copious amounts of butter and brown sugar can ruin the delicate flavor of the sweet potato. I will wax… sweet potatoes are great in savory preparations and go well with rosemary, thyme, chilies, peanuts, soy, and goat cheese – I can go on and on. On the other hand, we can open up the argument on whether the tuber is an actually a sweet potato or a yam; but, none of that is going to get the sweet potato biscuits made, on the table, and in your mouth. The flavor of sweet potato intensifies when roasted and they taste so much better than boiling sweet potatoes. Roast the sweet potatoes the day before or use leftover roasted sweet potatoes, just make sure they are chill. Also, roasting is a better way to manage the water content of the dough. Managing the moisture content is another key to success. Moisture in the sweet potatoes will vary depending on the sweet potato. 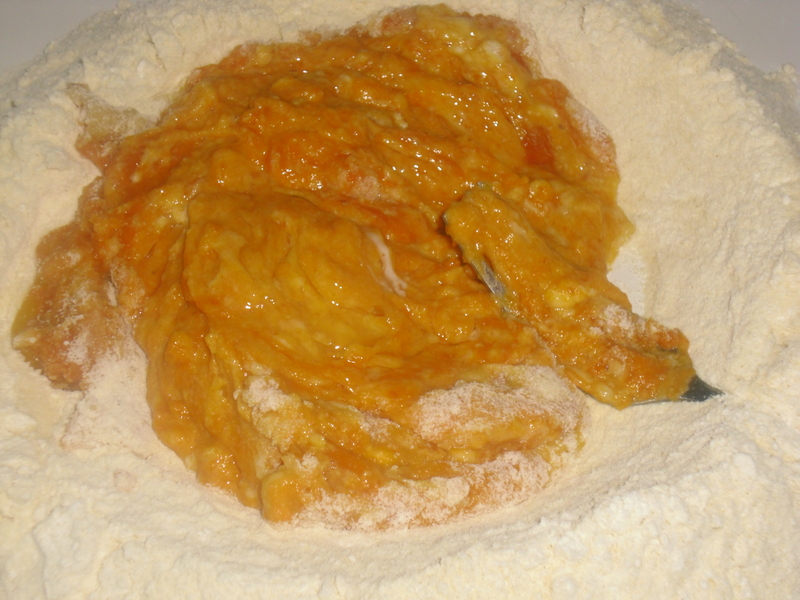 If the dough is on the dry side, add a few tablespoons of water to bring the dough together. 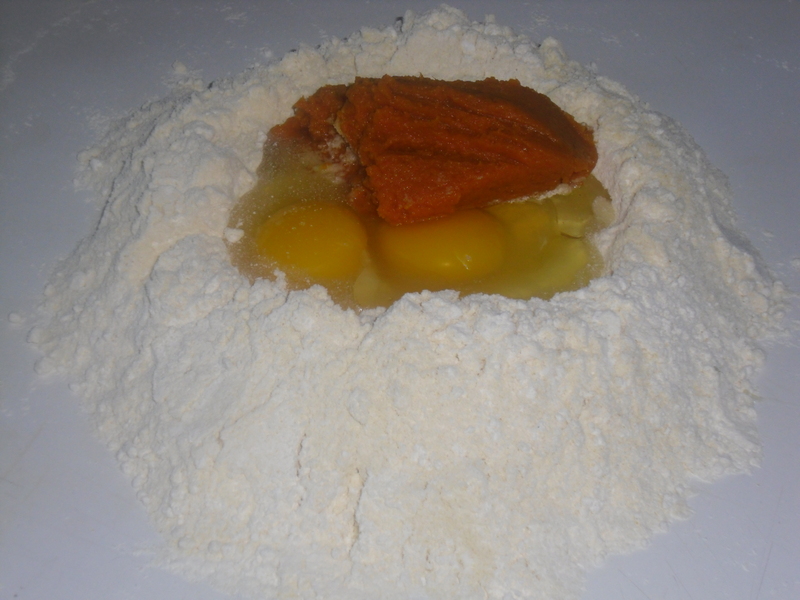 If the dough is on the wet side, add a few tablespoons of flour to make the down firm. Practice makes perfect on getting the proper texture. 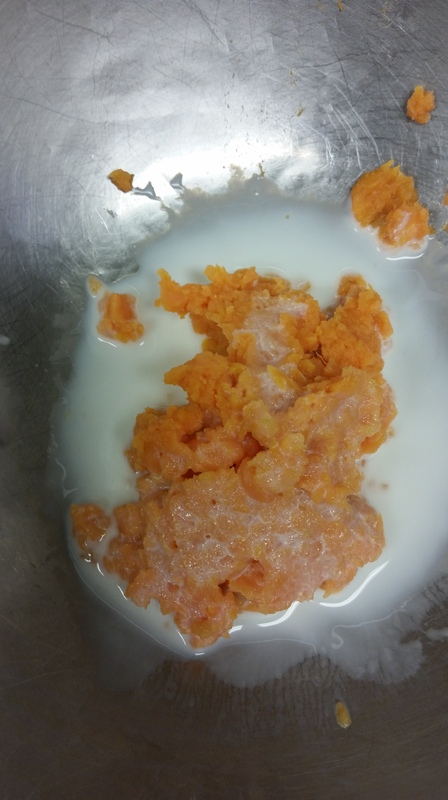 Start with very cold sweet potato mash, buttermilk, and butter. This will ensure flakiness when the cold biscuits go into the hot oven. 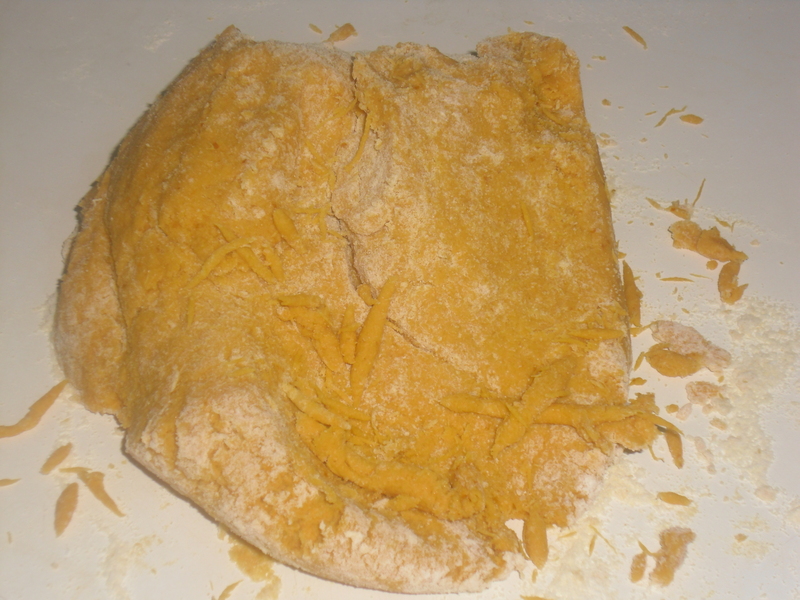 The butter will melt, releasing steam inside the dough and creating layers flakiness. To measure the ingredients, use a scale. This is the most accurate way to measure for baking and accuracy is important to manage the moisture and to ensure a light and flakey texture rather than dense and flat. In conclusion, on the longest quick notes, DO NOT OVER MIX THE DOUGH. 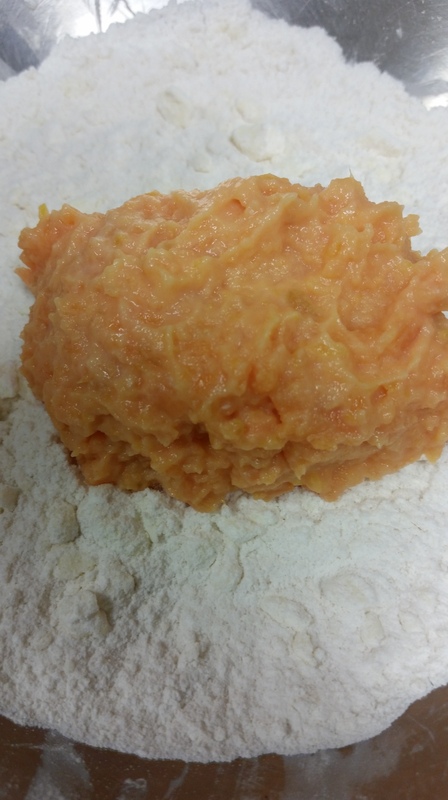 It is perfectly okay to see streaks of butter and bits of sweet potato in the dough. 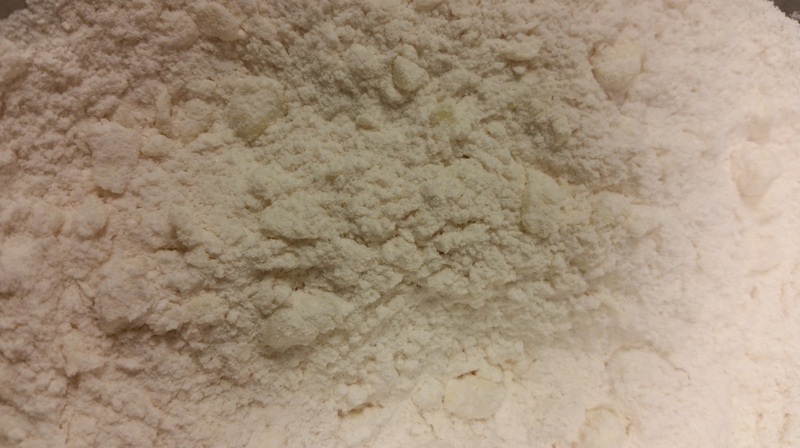 Pour dough onto work surface dusted with a little flour; knead dough until the dough just comes together, approximately 6 – 8 times – DO NOT OVER MIX. To make vegan sweet potato biscuits, substitute the butter with vegan margarine or vegetable shortening. 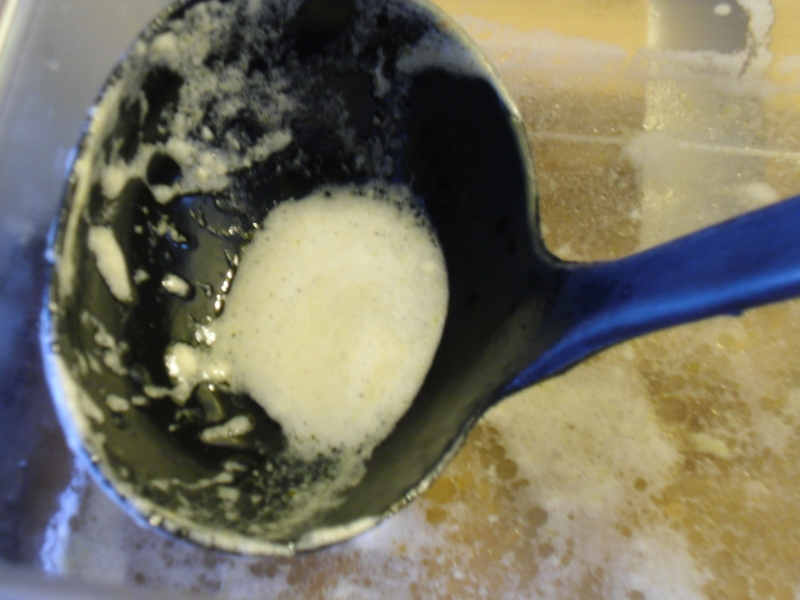 Substitute the buttermilk with soymilk and a few teaspoons of fresh lemon juice. Once you master making sweet potato biscuits, get super fancy, and personalize it with a few add-ins. 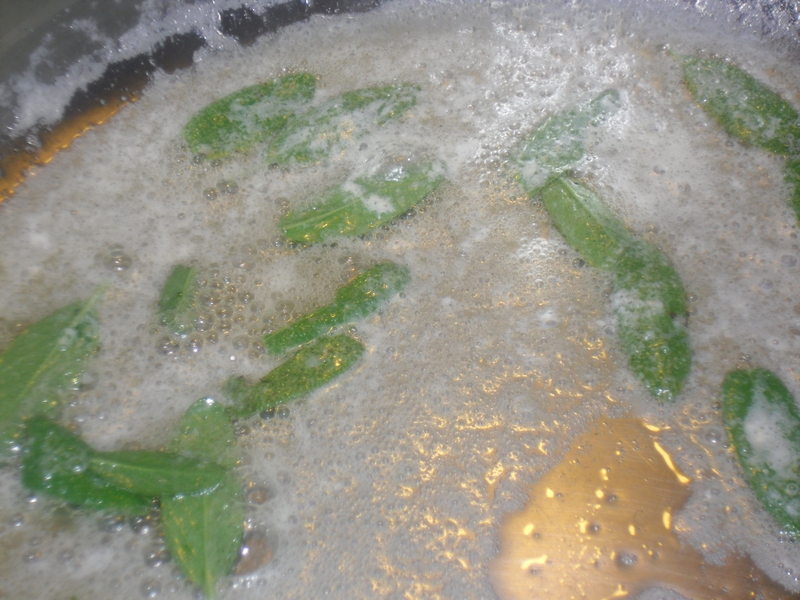 Add fresh chopped rosemary, rosemary, toasted pecans, and/or orange zest, to the dry ingredients for a twist. Before baking, brush with melted butter, and sprinkle with fresh cracked black pepper or even add the cracked black pepper to the dough. Just keep them simple and serve with or without lashings of butter and preserves or jam – and enjoy the redemptive qualities of the sweet potato in a southern staple. always in good T.A.S.T.E – cause you gottatastethis! 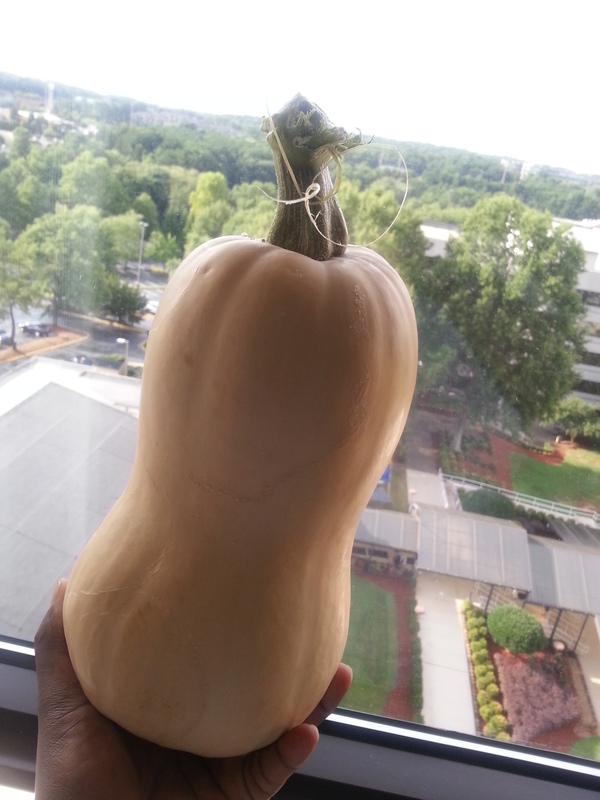 This summer, I became the owner of a beautiful 5 pound 14 ounce butternut squash… from a volunteer effort organized by my sorority. 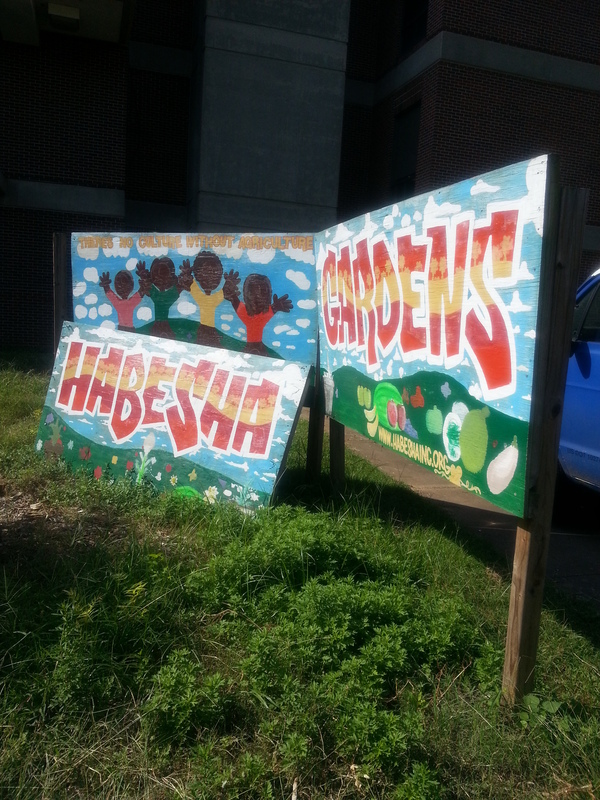 Planted during the summer months at the Habesha Community Garden in Atlanta, the squash vine took on a life of its own prolifically offering butternut after butternut after butternut. The vine was huge and twisty and still had a few butternut squash on it when we arrived to help ready the garden for fall and winter planting. Our mission: Remove the remaining squash and excavate the vine. The mission accomplished and the payment was handsome. Getting this lovely through the Atlanta airport proved interesting… TSA officers scanned it twice, few people looked perplexed, and a few passengers stopped to ask me about her when I shimmied down the aisle to my seat. I beamed as I told my inquiring row companions of my intentions with the butternut squash… the plans were to puree some, roast some, steam some, stir-fry some, and finally simmer some into a spicy, brothy soup. This was a lot of squash! 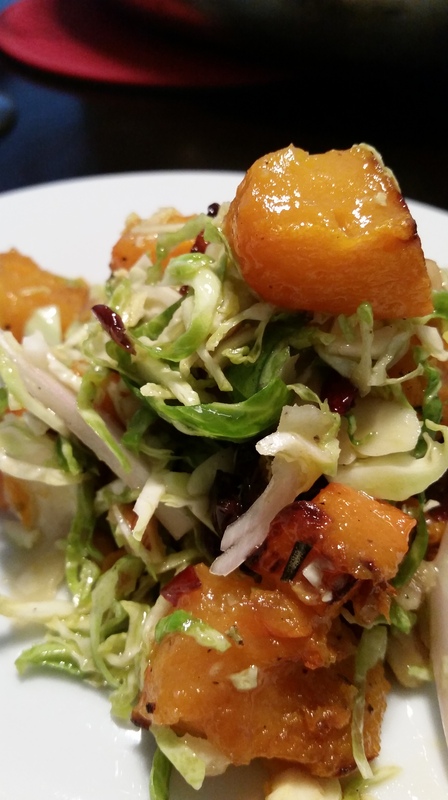 The best, by far, was a crunchy, luxuriously warm salad of roasted butternut squash, shredded Brussels sprouts, toasted walnuts, and cranberries tossed in a warm Maple-Dijon vinaigrette with a few shavings of Parmigiano Reggiano. All of these flavors play exceptionally well together… but they are also interchangeable. 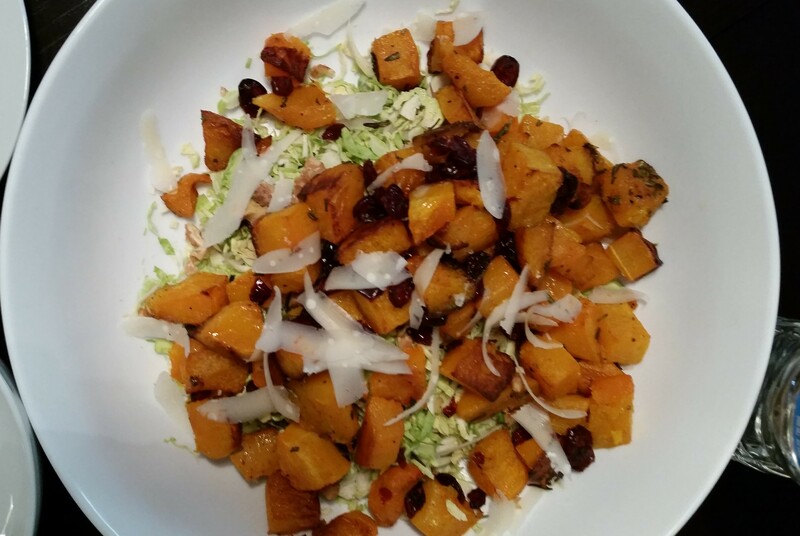 Any winter squash will work in place of the butternut and roasted sweet potato makes for a yummy replacement as well. 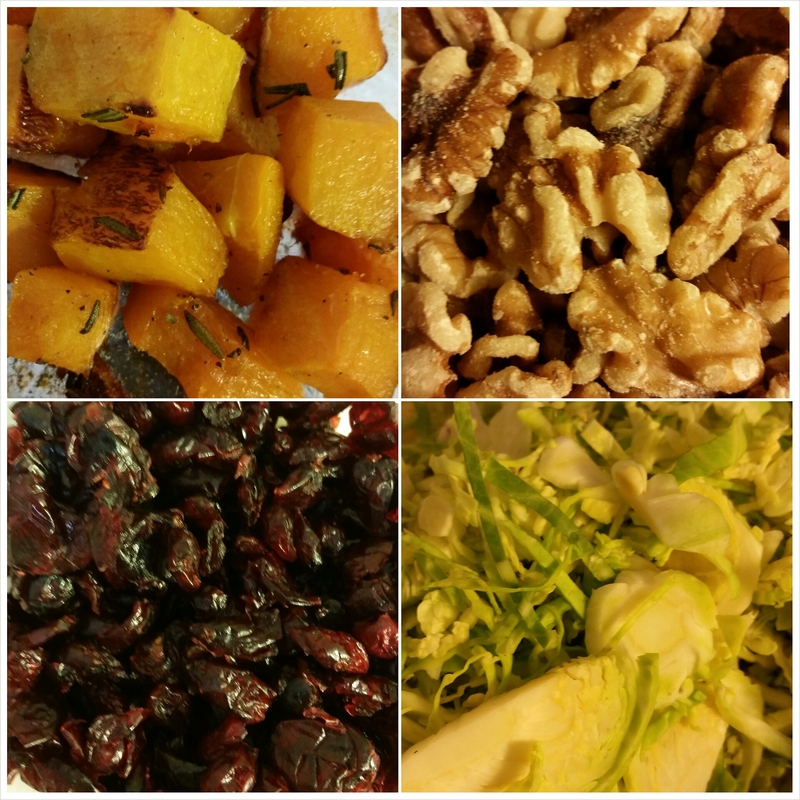 Toasted pecans, almonds, cashews, or hazelnuts are all delicious substitutes for the toasted walnuts. Dried cranberry replacements can include raisins or dried cherries. The shredded Brussels sprouts were actually a replacement for kale; but collards, Swiss Chard, spinach, and finely shredded cabbage will all do the job deliciously… and eating salads all year round becomes a real thing and not yet another urban myth. It’s been awhile since I’ve written a new blog… but we shouldn’t dwell on this fact. Let’s instead dwell on the fact that autumn weather has finally arrived in south Florida and, finally, nearing the end of October, we are ready to enjoy the richly flavored foods that make this time of the year wonderful. Yes, this is a better place to shift our focus. 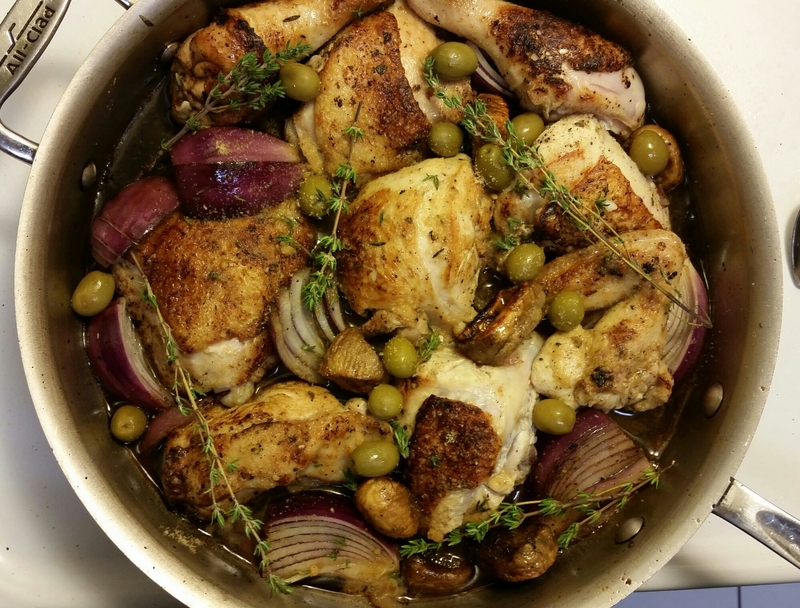 What could be a more fitting dish to gather the attention than – Pan-Roasted Chicken with Dried Figs, Green Olives, Red Onion, and Thyme. Roasting anything automatically evokes feelings of comfort and warmth. 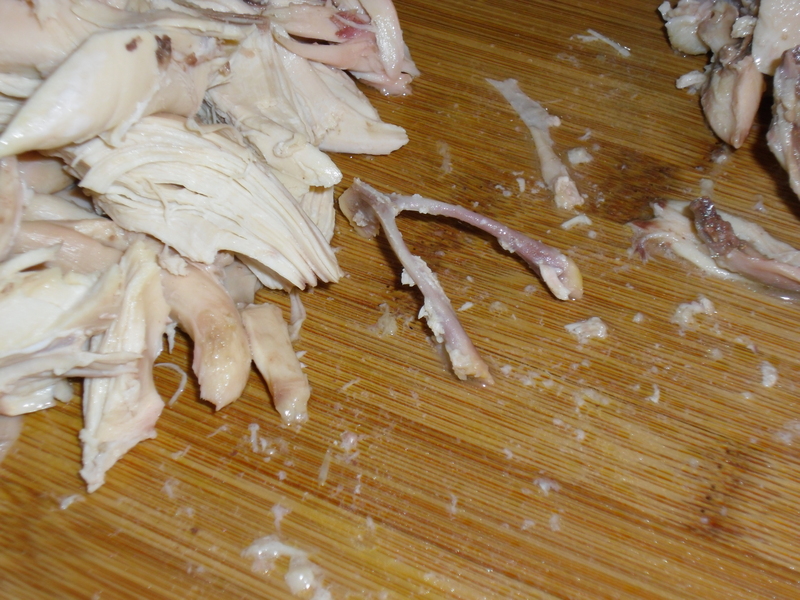 Chicken is a most accommodating host to absorb flavors. Dried figs provide lush sweetness and they soften during the cooking process. 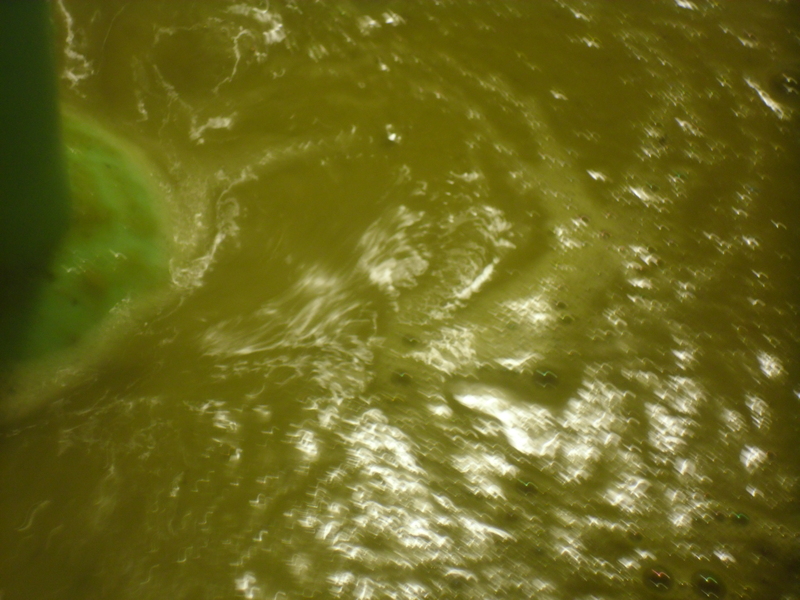 Green olives bring briny saltiness that reel in the sweetness of the fig. Red onion, visually more appealing than its white counterpart, serves as the mediator gently taking the best from sweet fig and salty olive, bolstered by garlic, and mellowing into savory umami. Thyme, lovely in so many ways, is interchangeable with any other hearty herb. Rosemary and Sage will both work. A collection of all three herbs will work… as echoed by Simon and Garfunkel’s Scarborough Fair. A word about Roasting Meat, Poultry, and Fish: All will taste incredibly better; all will be considerably moister; and all will cost significantly cheaper if you leave the bones in the meat and leave the skin attached. Period. End of argument. So don’t ruin this dish with boneless, skinless chicken. You can serve this dish with anything from rice pilaf, bulgur wheat pilaf; roast or mashed potatoes; or even a simple crusty loaf of bread and a seasonal appropriate salad (referencing my love/hate relationship with kale salad – a rant for another time). I wanted to end this post thanking readers (read new subscribers) that have found their way to the blog and those (read older subscribers) who have sent me emails regarding blog updates. I could not figure a clever way to include this without an awkward sentence… so…. Life gets in the way of living sometimes; but, I will try not to stay away too long. Awkwardness complete… now go roast chicken with bones and skin intact. Sweat dripping down my back at 7a in the morning while watering my garden indicates that summer is in full swing. However, I refuse to miss the delicate and yummy foods that herald in spring in lieu of the full-blown barbecue season. Barbecue season provides much smoky, fiery, grilled, and charred fun glazed with sticky, sweet sauce – BUT let us give remembrance to the week of south Florida spring. A moment to transition your taste buds from braises and stews to smoky and charred, a fleeting moment perhaps – Lemongrass Poached Chicken with Vegetables. This dish is a one-pot comforting, restorative, reinvigorating cure-all. 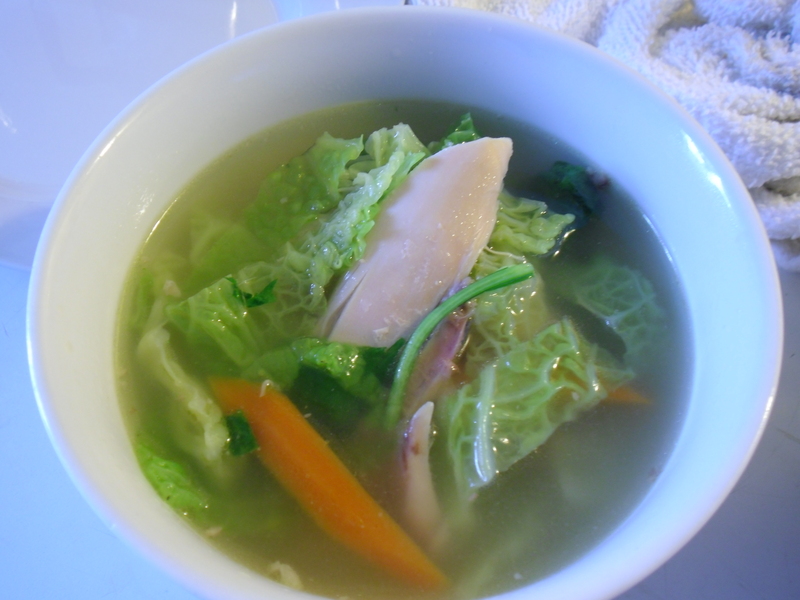 It is a delicate, brothy chicken infused with lemongrass, ginger, garlic, and Thai chilies. 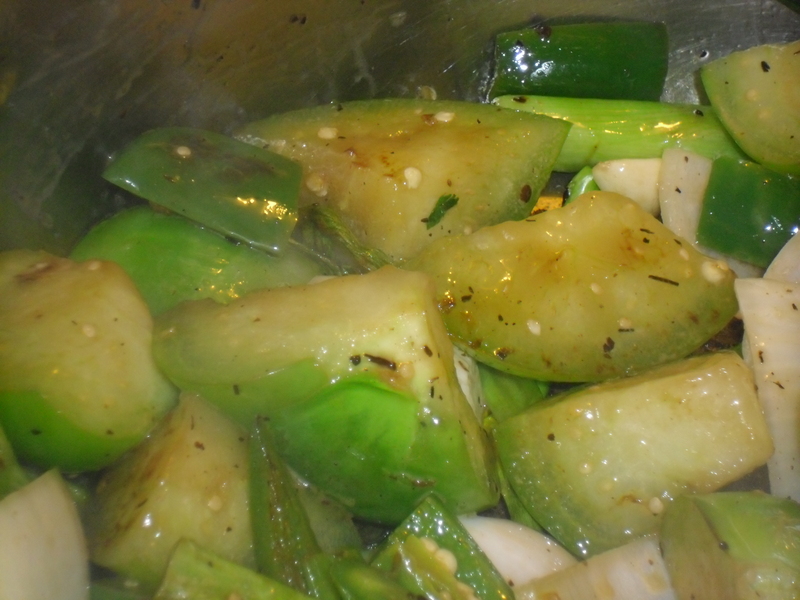 The idea for this dish formulated while harvesting the lemongrass growing in my garden. Haphazardly, I cast a handful of lemongrass seeds five years ago in a cinder block filled with soil and promptly ignored it. Without much care or pruning, lemongrass grows out of control, at times reaching well over 65” tall. I hack it back to a more manageable hedge and, almost overnight, it sprouts back up. 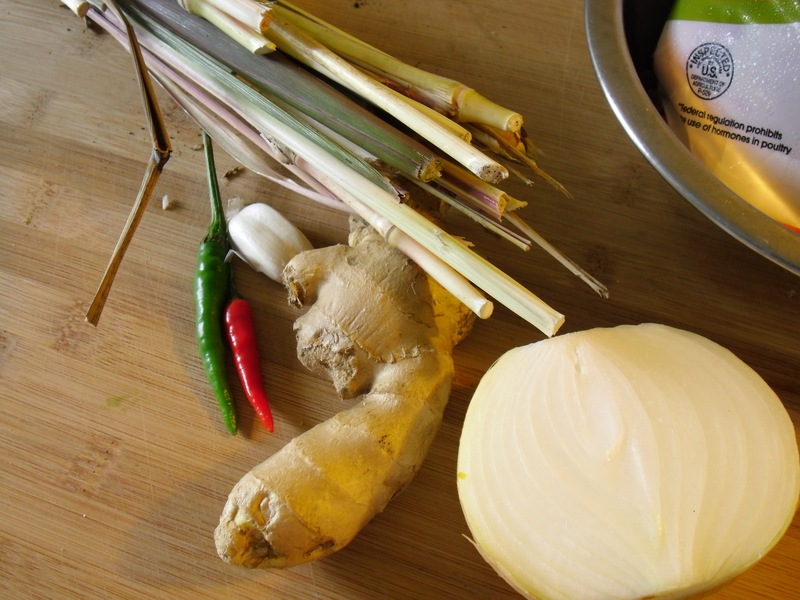 I usually use lemongrass in the kitchen in Thai, Indonesian, and some western Asian dishes (you can also use it to scent soaps, candles, body washed, lotions, and hair butter blends). 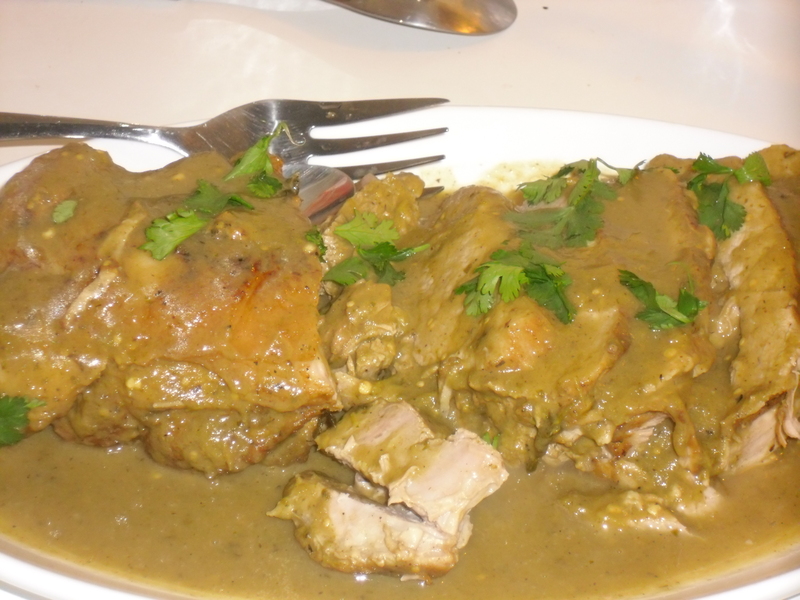 It is very necessary for Thai curry paste, Beef Rendang, and makes great tea. Infused into simple syrup, lemongrass adds a tropical floral lemony delicate flavor to sorbets, cocktails, cakes, and sweet salad dressings for fruit salad. In this dish, lemongrass is refreshing and provides just a slight bit of citrusy acidic to play a formidable Bonnie to the peppery ginger’s Clyde. Serving the poached chicken and vegetables alongside a bowl of steamed white or brown jasmine rice makes it a sustainable meal, though rice, wheat, or soba noodles would be good as well. After a few conversations with different people in the course of a week, I concluded that the heavens were telling me to create this dish. Yep, that is my story, I am sticking to it, and, after you try this dish, you will agree with me. Conversation Topic #1 – Pumpkin Patches are starting to set up this time of the year and I volunteered to help unload with my church. As I lifted pumpkins, rolled wheelbarrows, and help stage them on bales of hay (imported to South Florida, no doubt, for authenticity! ), I thought about all of the possible ways to use pumpkin besides in a pie. 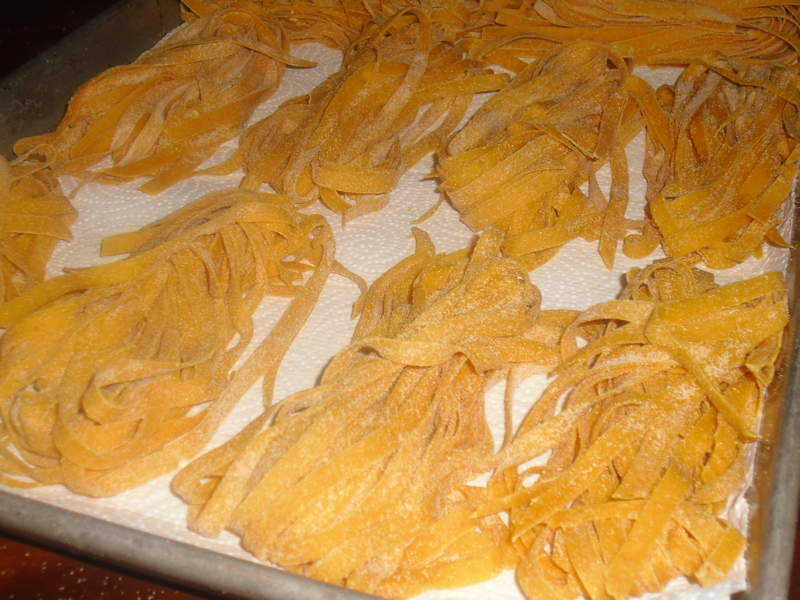 Conversation Topic #2 – I taught an overly anxious and eager group of teenagers how to make homemade pasta. It is much easier than you think; but it is time consuming compared to opening a box. 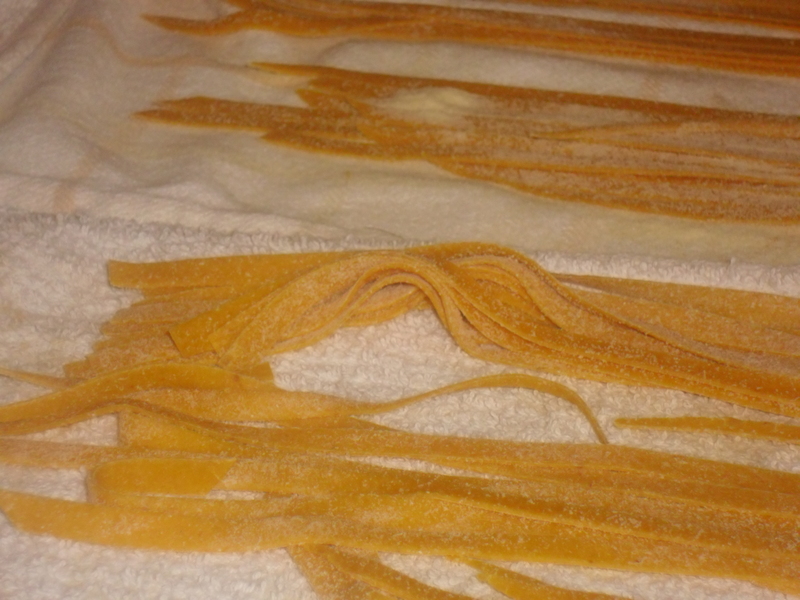 Of course, fresh pasta, the flavor and the texture, are worlds away from dried pasta. Is dried pasta inferior to fresh pasta, they ask. No, I answer, fresh and dried both have their merits and the ingredients in both are generally the same. You can flavor fresh pasta with whatever you want – which is an advantage. Score! Together, we make a spinach fettuccini with fresh spinach. We pair it with a Mushroom Alfredo Sauce. Not sure, but I thought I heard them calling me a Culinary Goddess. Yep, this is a true story to the best of my recollection. Conversation Topic #3 – “We should pick up something for dinner tonight at the farmer’s market,” she says. “Is this cauliflower okay?” “Yeah,” I say, half-paying attention because…. “Look at these fresh pastas! Beet, porcini, pumpkin, squid ink….” Yes! Get the cauliflower. 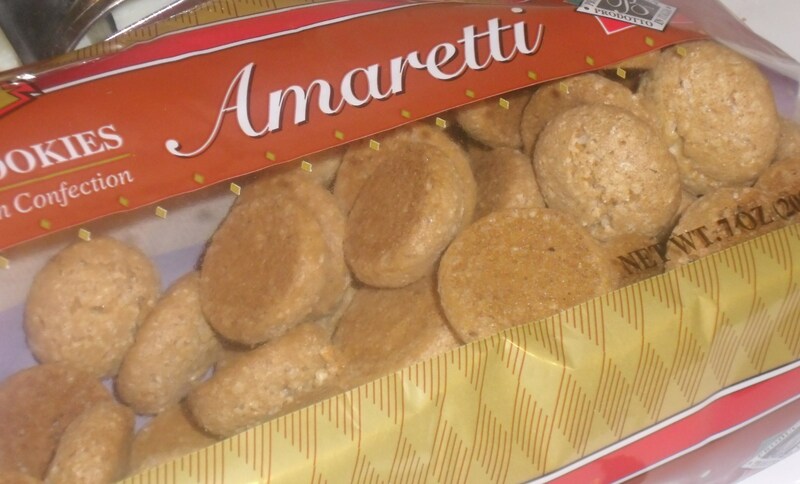 Conversations Topic #3.5 – “You know,” starts the stranger, who is intruding into my conversation, “I had this pumpkin pasta on South Beach and the chef grated amaretti cookies over the pasta like Parma. It sounds weird but it was delicious.” I smile, ignoring the intrusion and thinking to myself – sounds like dinner to me. Making Pumpkin Fettuccini is not a quick process so make it a project for when you have the time – I promise you will totally appreciate the investment. Use canned pumpkin instead of roasting your own pumpkin. 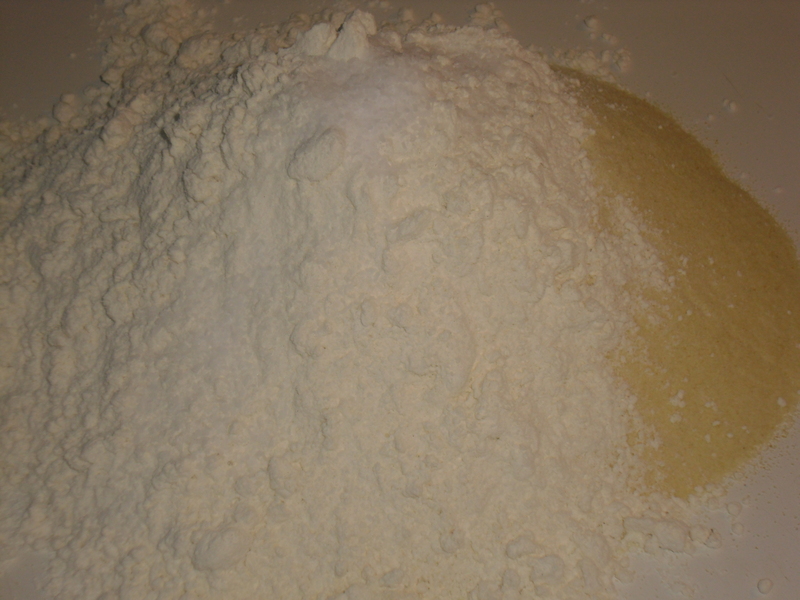 It is easier, quicker, and the moisture content is perfect for making pasta. Fresh pasta cooks faster than dried pasta and this pasta will cook even faster than the fresh pasta that you will buy from the market if you cook it on the same day that you make it. Expect the cooking times to vary. After pasta comes to a boil, fish out a piece and taste the pasta to determine it’s doneness. 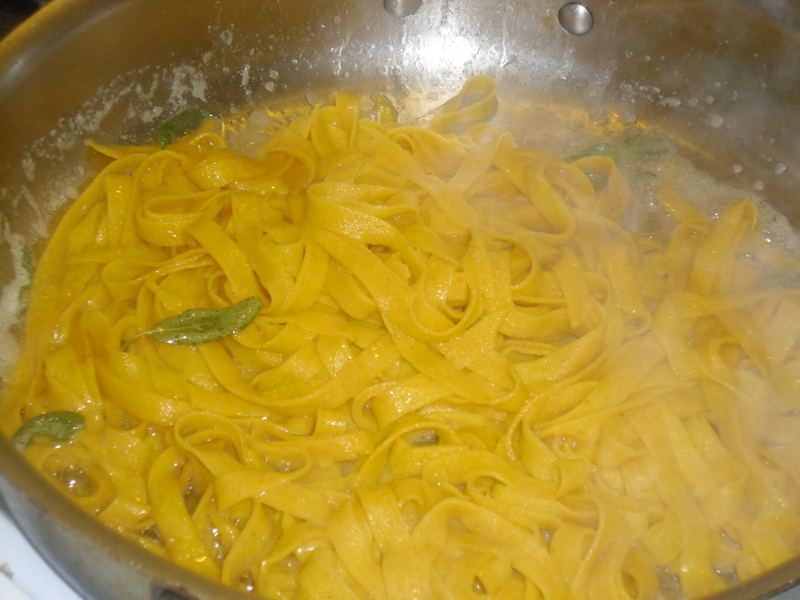 This recipe will make enough Pumpkin Fettuccini for 11 servings (at 2oz per person). You will only need 6 oz for the recipe below. The remaining pasta can be store by leaving the bird’s nest or bundles out at room temperature for 24 hours to thoroughly dry and then freezing for up to three months. To cook from frozen state: simply boil water and drop pasta in, as you would dry pasta. The keys – yep, KEYS! – to making this dish, work is the nutty (1) Sage Brown Butter Sauce, it is simple and classic with pumpkin. 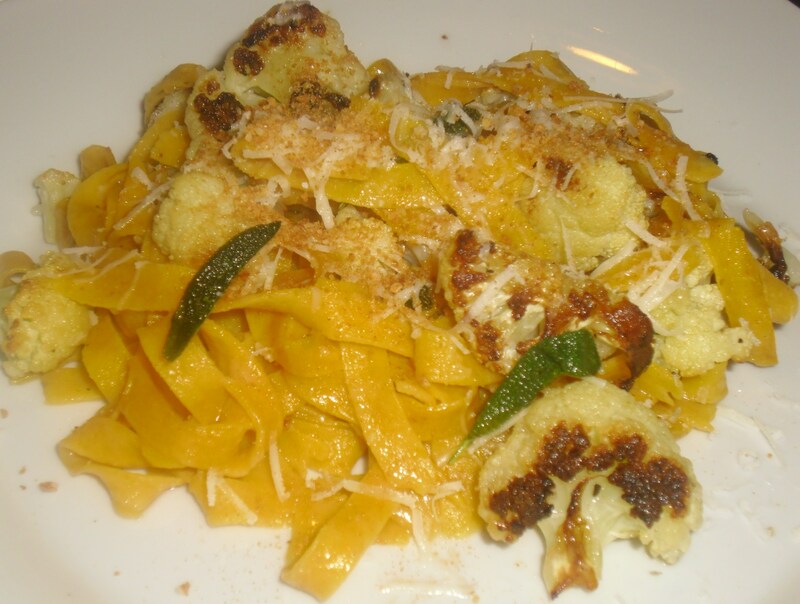 The (2) Roasted Cauliflower offers a drastic visual contrast against the orange color of the pasta and gives the dish a “meaty” mouth-feel. Finally, do not underestimate the power of the (3) Amaretti cookies in this dish. Their sweetness rounds out each mouthful of this silky fresh pasta highlighting the subtle delicate pumpkin flavor while playing masterfully against the savory saltiness of the Parmigiano Reggiano… and providing a textural boost. Pumpkin Fettuccini w Roasted Cauliflower, Amaretti Crumbs, and Sage Brown Butter Sauce is an ethereal experience so I am pretty sure it would be a great way to celebrate celestial and otherworldly visitors on Hallowe’en. So… after a lengthy hiatus for the summer, I have been fretting over which recipe would be the first out of the gate to share for the start of Fall. Awww Fall… welcome back my cooler- weather, braise-loving, comforting-love, soup-slurping friend… welcome back. 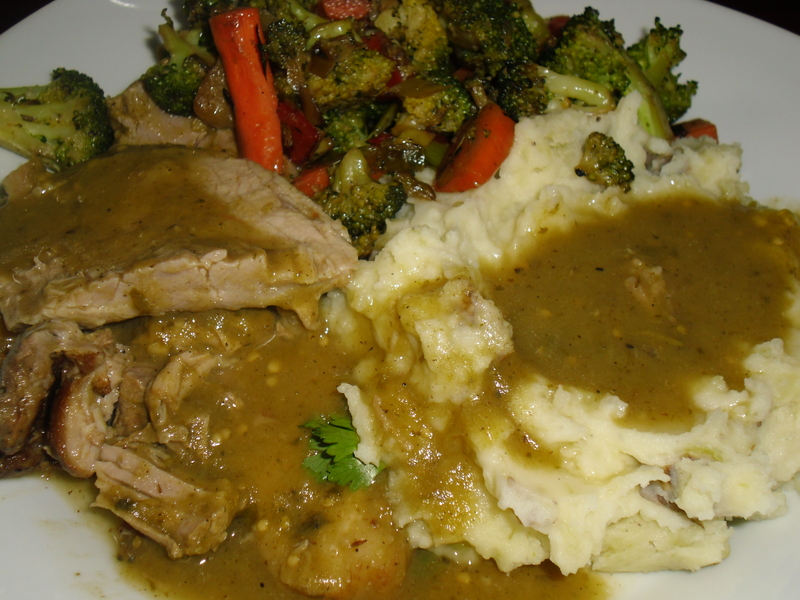 First out of the gate is a winner – Green Chile-Tomatillo Braised Pork Roast. I love the dish so much that I made this dish at the tail end of summer, though not quite at the tail, just because I envisioned making it for a Fall Sunday dinner party in which I would invite some of my favorite people over to indulge. However, I could not wait – no, I could not. 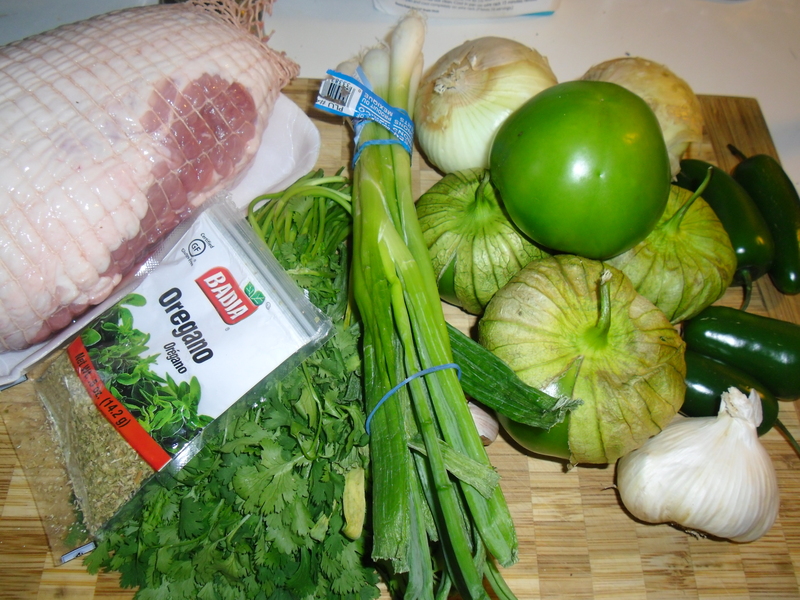 Warming and comforting, Green Chile-Tomatillo Braised Pork combines the unctuous richness of pork with the savory sweetness of garlic and onions; the earthiness of cumin; the brightness of tomatillos, cilantro, and fresh lime juice; and the spiciness of jalapenos. 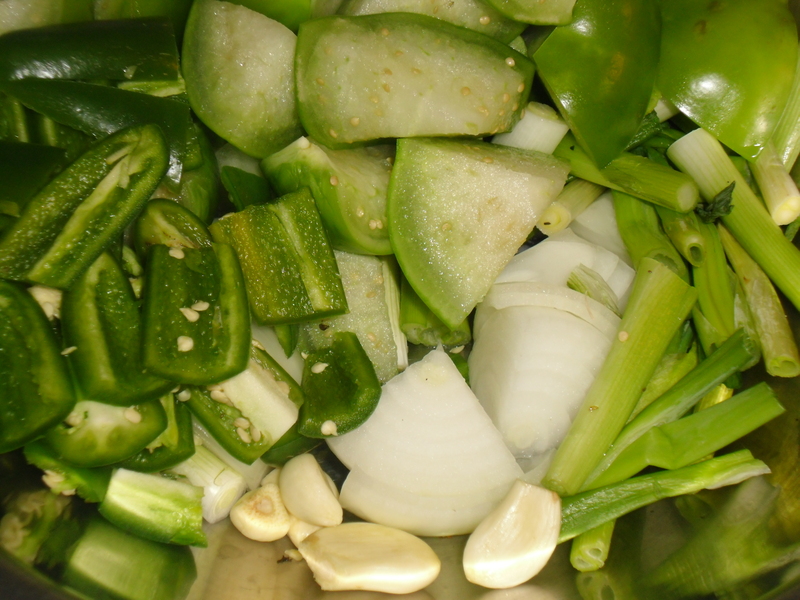 Control the spiciness of the dish by removing the jalapeno seeds and white membranes – leave them for more heat; remove half for medium heat; and all for a mild heat. Simple boiled or steamed rice makes a nice partner to sop up all of the sauce of this dish; but I like creamy Olive Oil Mashed Potatoes… along with some pan-roasted vegetables. 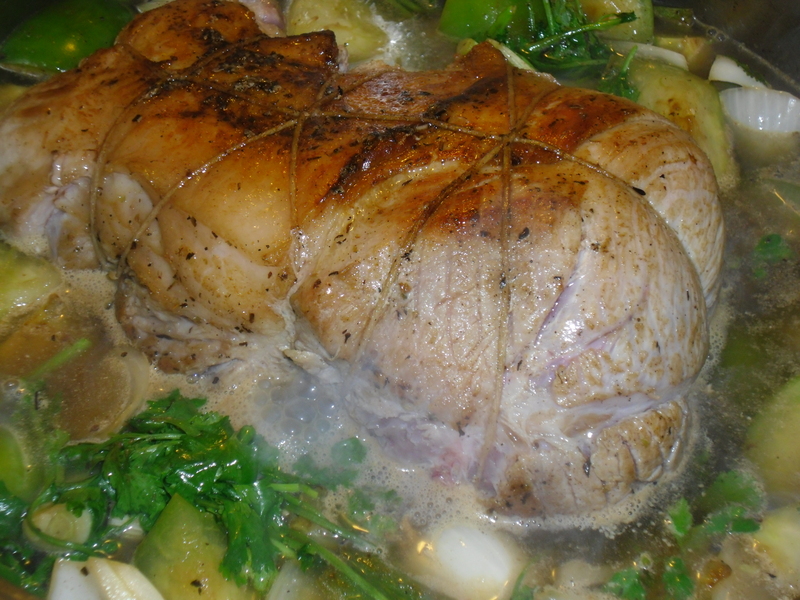 This is a luxurious slow cooking dish, as most braises are, so plan to make this on a weekend that you can relax while this roast simmers, filling your home with aromas of delicious goodness. 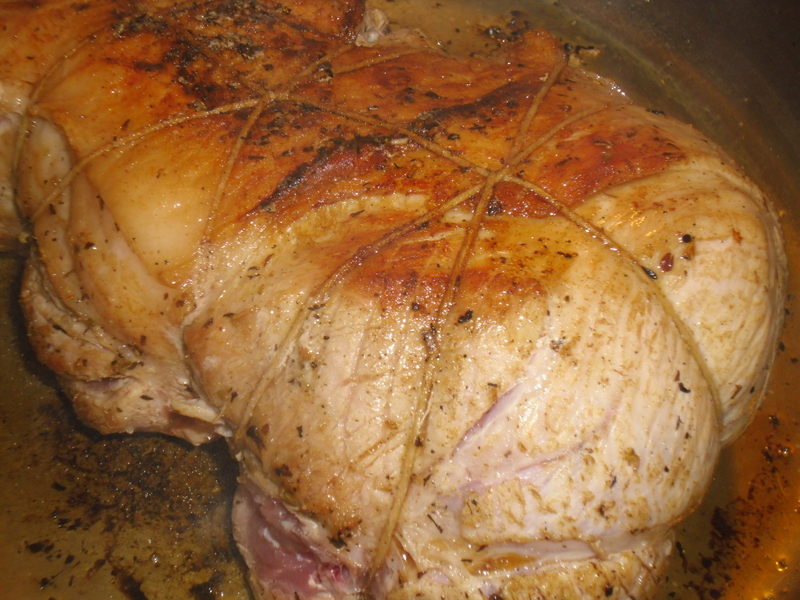 You can also use a slow cooker or a pressure cooker, after first browning the roast. The slow cooker will significantly increase the cooking time and the pressure cooker will significantly decrease the cooking time. The straightforward method I used below is ample enough cooking time for the aromas to tease taste buds. Making the creamy Olive Oil Mashed Potatoes to serve with this dish is quick, easy, and simple. Boil potatoes, peeled or unpeeled is a matter of preference; mash potatoes; substitute your best olive oil for the amount of butter you would normally use in mashed potatoes; and season with kosher salt and ground white pepper to taste. The leftovers, if you have any, will make wonderful hot sandwiches stuffed into fresh baguettes or hoagie rolls to soak up the sauce, or even warm soft flour or corn tortillas for burritos, enchiladas, or taco – top with shredded cabbage, crumbled queso, diced tomato, and sliced red onions. 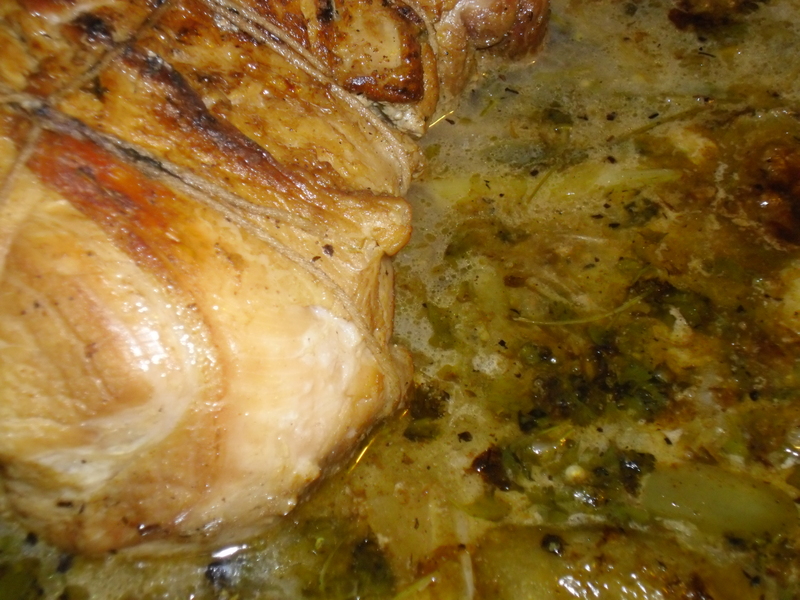 If pork is just not your choice of protein, this recipe and flavors work tremendously well with turkey legs and thighs. The richness of the turkey meat stands up to the seasonings and is suited nicely for long, steamy braising. 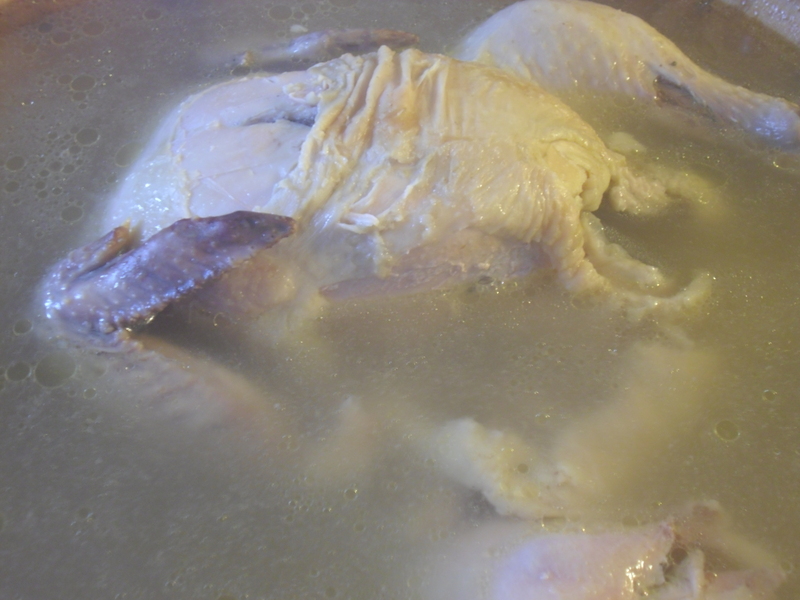 Start with skinless turkey so that the caramlization from the browning remains in the pot to flavor the dish rather than tossed when the skin separates from the meat becoming soft and slimy during cooking. Enjoy the start of Fall with a Green Chile-Tomatillo Braised Pork Roast centerpiece… and invite a few friends over who might be struggling with having to bid adieu to their summer grills right now. A few bites in and they will embrace the change of seasons deliciously easy. For the festivities… I offer a recipe for something quick, simple, and deliciously filling side dish – Colcannon. This dish is quick because you can make it in less than 25 minutes (10 minutes if you have left over mashed potatoes on hand). It is simple because it only takes four ingredients that many people already have on hand this time of the year: potatoes, hearty leafy greens: cabbage, kale, or chard, green onions, and butter (kosher salt and black pepper are a given). Deliciously filling? Well, it just is – trust me on this. Traditionally, colcannon gets a another knob of butter in the center just before serving and you can even add some warm milk; cream; or soymilk for a maximum creaminess and softness. It is also a tradition to serve it along side Irish bacon. Personalize this dish any way you want. 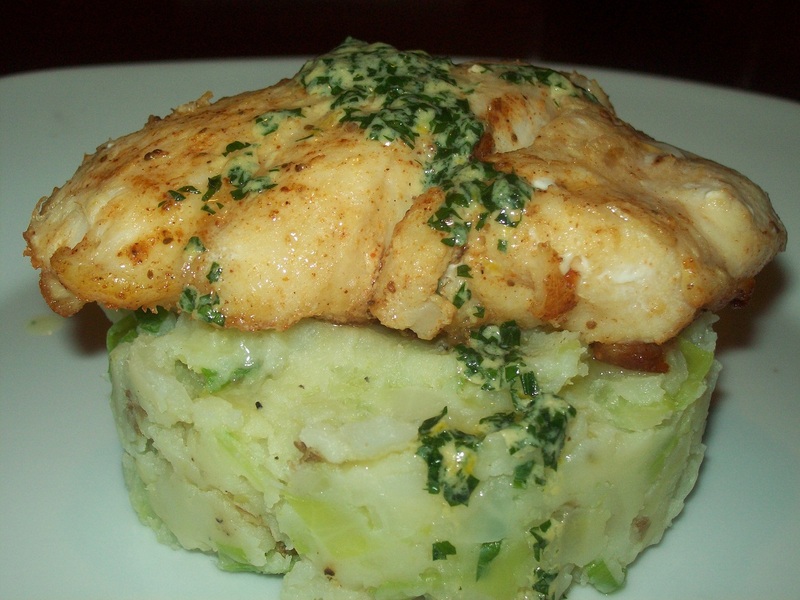 For dinner, I pressed the colcannon into a ring mold to create a pedestal for a piece of broiled fish topped with a simple parsley and Dijon mustard sauce. The next morning, I shaped the cold leftovers into patties; dusted them with a little flour; and pan-fried the patties in a little canola oil until the outsides develop a golden brown crust and the center of the patties were warm. I topped the patties with deli ham and a fried egg – add a ridiculous amount of hot pepper sauce and I am sure that this will make a perfect hangover breakfast after a night spent downing green beer.